On Sundays, the busy roads on each side of the Seine are closed to motor traffic and the walkers, bicyclists, and rollerbladers take over. We joined them -- walking, of course. 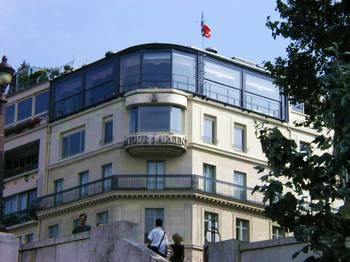 So today I have photos from this long walk -- all the way from our neighborhood in the 15th arrondisment, along the full length of the Seine's left bank, to the Jardin des Plantes and the Gare d'Austerlitz. 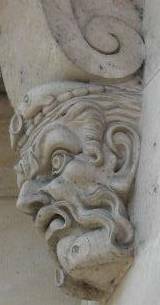 At left is one of the carved heads on the recently restored Pont Neuf. 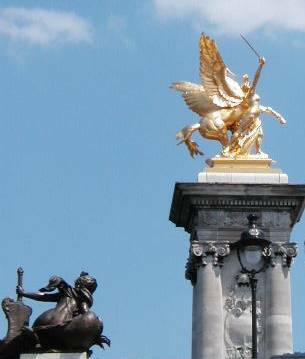 At left, statues on my favorite bridge, Pont Alexandre III. While I have the space here, I want to tell you about a few other discoveries from the past week. We happened upon another English language bookstore called Village Voice at 6, rue Princesse in the 6th arrondisement. They had a great collection of V.S. Naipal books so Tom bought another one. They will be closing in a couple weeks for renovations, so we won't be able to visit again until next year. A very nice English-speaking French woman was running the shop. Another surprise one day when we were at the Luxembourg Gardens was that there is a free exhibit of the work of Reza, a famous Iranian photographer. The images are huge, and are mounted on the outside of the iron fence surrounding the park. Haunting and beautiful images. At left, view of the Seine when the roads are closed to autos. 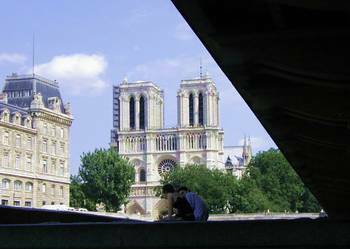 At left, the steeple of the American church rising above the trees, and then the more elaborate steeple of Sainte Chappelle on the Ile de la Cite. After the Gay Pride parade on Saturday, we found a practically hidden square near the Place des Vosges where we refueled at a cafe called Le Marche. 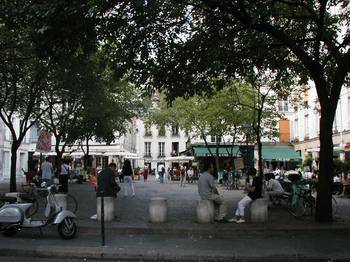 The square, called Place due Marche Sainte Catherine, is shown below. 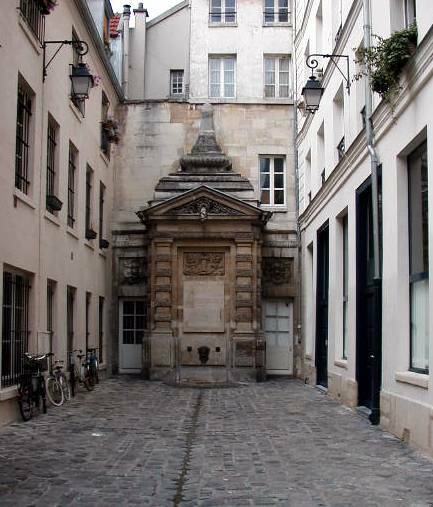 Near this Place is a tiny dead-end street, Impasse de la Poissonnerie, with a lovely fountain, below. 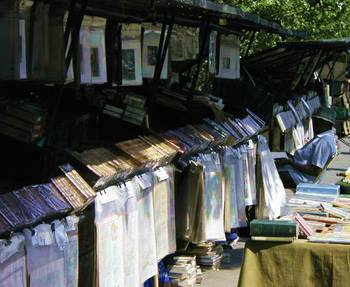 On our walk along the Seine, we often admire the wares of the booksellers (left). 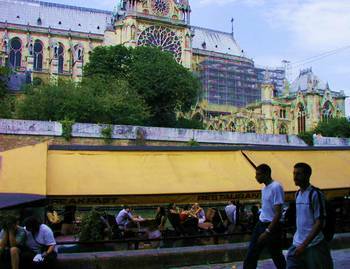 On the evening of June 26, there was an unauthorized gathering at the Place du Pantheon. A little before 9pm, nearly a thousand people dressed in white set up card tables with white tablecloths and had themselves a very fancy picnic. This was the 13th edition of the Diner blanc. 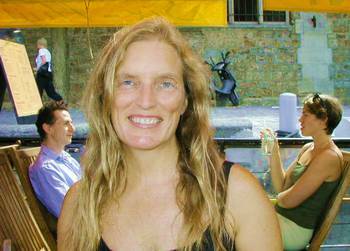 Every year, it is organized by an anonymous person who sends out invitations in the mail. Everyone invited must keep the event and its location secret. At 8pm, small groups of people in white start to appear. By 9, the picnic is underway, complete with champagne and "genereuses victuailles," according to Le Parisien. 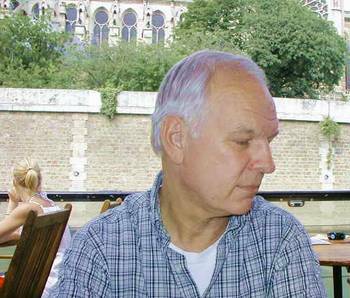 A very famous and very expensive restaurant, Tour d'Argent, on the Seine (left). On Saturday evening, we had dinner at a good and NOT expensive restaurant very near the apartment. This place is new for us - we noticed it on our way home from another resto earlier in the week. It was full of people when other places were mostly empty. We always take that as a good sign. The fixed-price menu including appetizer and main plate was only 15 euros! Try it: Le Boudoir Restaurant, 22, rue Fremicourt, in the 15th, phone 40-59-82-28. I had duck and gaspacho with an avocado mousse, and Tom had a fish brandade -- it was all excellent. Mid-way on our walk yesterday, we stopped at a floating bar to refresh ourselves and rest our feet. 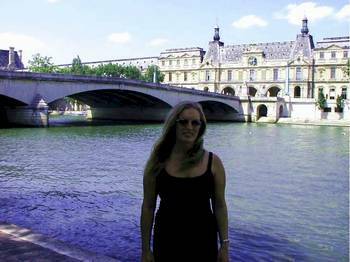 It was a surprisingly reasonable place, directly across from Notre Dame on the left bank (Quai de Montebello, 5th arrondisement). The waiter told Tom, in French, that when Tom speaks French he has the voice of Alfred Hitchcock. We laughed. Then Tom imitated Alfred Hitchcock in English, saying "Good evening." The waiter was delighted. He said it was "incroyable" (incredible!). Here is the place (at left). We saw no evidence that they serve any kind of food -- just drinks -- although note that the awning says "breakfast." Earlier in the day, we'd had a salad at Oh Poivrier, one of our old standby lunch places on avenue de la Motte Picquet. So we didn't need much for dinner. We ended up finally revisiting Le Tipaza (150, avenue Emile Zola, 45-79-22-25), the North African restaurant around the corner from the apartment, where we had excellent steaks with b�arnaise sauce. At both of these restos, we noticed a weird and disgusting practice: smokers who don't use the ashtray provided, but instead flick their ashes on the sidewalk right next to US. One even tossed her cigarette butts out on the sidewalk, whereupon the older and dignified waiter at Le Tipaza kicked them into the gutter. He wasn't pleased with this loud, annoying young French woman and her filthy smoking habits.